Almost all of the “productive” things I’ve done in my life (software, books, web sites, literary events), have resulted from a referral. Someone referred me, gave out my number or email. In other words, my marketing efforts are poor to nil. For this, I have always believed that you need to seize opportunities as they present themselves. Meaning, you need to know how to make an effective presentation and have an elevator pitch prepared for every situation. An elevator pitch is that message that within seconds summarizes what you do and how you can help your listener. As the name implies, it’s a pitch that you can make during an elevator ride. I have one for every compartment of my life. I usually use labels, shortcuts that may help my listener to know what it is that I do. “Software developer” is the label I most frequently use. “Writer”, “Digital editor”, are some of the others. But after reading an article from Steve Pavlina, I realized that I’ve been wrong. The key is that good marketing messages go beyond labels. As soon as someone labels you as falling into a particular career bucket, it gives them the opportunity to dismiss you. They tune out and stop listening to what you have to say. But if you present them with something that defies immediate labeling, you make people curious. You present an enigma they have to solve. You open the door to an interesting conversation. The best example is that every time I mention what I do, I end up giving advice on Windows and antivirus. Labels get you nowhere. I certainly don’t expect everyone to be a potential client. But what is true is that the absolute majority of the people I talk to, can refer me to a client. Provided that I awaken their interest. In his article, Steve Pavlina recommends a product, Insider secrets to 15 Second Marketing (affiliate link) by Charlie Cook, which I cannot stop recommending. Cook takes you by the hand to create that line, that enigma that you can present to a listener in order to strike up a conversation that will lead you to a sale. But 15 Second Marketing does not stop at the elevator pitch to find referrals, instead it also teaches you how to create a slogan that you can use to promote yourself, close a deal with a potential client, or simply make people remember who you are and what you do. The headline I used as an example in this other article. I make business solve their fixed assets problems. I empower writers to publish online. 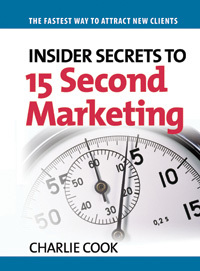 If your marketing efforts are as poor as mine, take a look at Insider secrets to 15-Second Marketing. Even if you hate to market yourself, you’ll understand that there are ways to do it in an informal conversation, without being noticed.